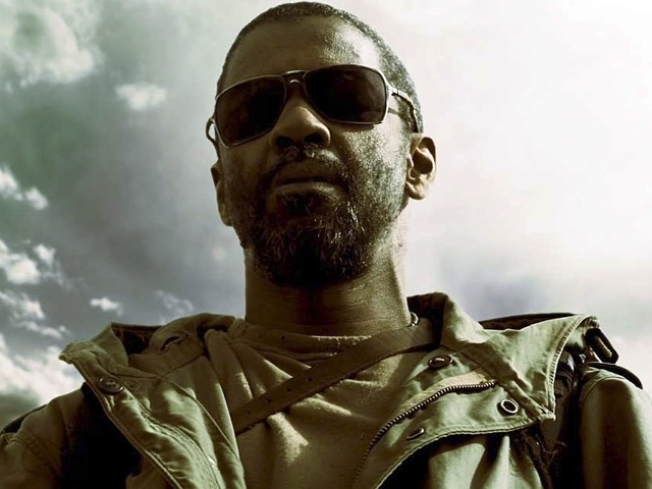 Denzel Washington stars in “The Book of Eli” as the possessor of the last remaining copy of the Bible, a weapon "aimed right at the hearts and minds of the weak and the desperate!” in the words of our villain, who wants the Book for his own nefarious purposes. It's the oft-told story of a lone traveler making his way across a desolate landscape, but it's well told. Washington brings all of his cool to the role of Eli, a man who doesn’t want any trouble, just some water and a charge for his iPod (perhaps the most preposterous thing “Eli” asks you to believe is that an old school click-wheel iPod still works some 30 years from now) as he makes his way west. Gary Oldman, famous for many things, but not his cool, inexplicably shows restraint in his role as the villain Carnegie. Perhaps he’s spent too much time hiding behind Commissioner Gordon’s mustache. But in a role where his gift for chewing scenery would be appropriate and even welcome, he holds back, robbing the film of some potential fun. With the Bible on his side, Oldman is sure he can bend the remaining survivors to his will and inspire them to rebuild. He doesn't believe in the Bible, only its power over people. Eli, of course, knows the book is man's only hope. Mercifully, the film avoids getting too preachy. When the two men cross paths, Carnegie tries to ply Eli with the feminine wiles of his own stepdaughter, Solara (Mila Kunis), who instead falls under Eli's spell and joins him on his journey. Directors Albert and Allen Hughes’ last feature film was 2001’s “From Hell,” about the hunt for Jack the Ripper, but their gift for choreographing violence is still in evidence and the world they create is appropriately barren without being suffocatingly bleak. They're also smart enough to know that they’re on well trod ground with “Eli,” and give the genre its due, with a nod to “A Boy and His Dog,” the 1975 Armageddon classic starring Don Johnson -- watch for the poster in Eli's bedroom. “The Book of Eli” is an entertaining movie that occasionally gives in to the pitfalls of its genre despite its better judgment. That said, if you see a trailer for “The Book of Solara,” a shockingly real possibility, turn and run. Watching a post-apocalyptic tale is one, watching a post-post-apocalyptic tale is totally unnecessary. Curious side note: In 2001, Washington and Ethan Hawke co-starred in “Training Day,” with the former becoming the first black man to win a Best Actor Oscar and the latter getting a supporting actor nomination. More than 8 years later, "Eli" is being released a week after Hawke's "Daybreakers," another post-apocalyptic movie directed by twin brothers. Could it be that the end really is nigh?